present in the literature and they were found to yield good agreement with the measured values. corner of the plugged tee to that in an elbow. Deng et al. the collision model to handle complex engineering flows. that the model is designed for dilute systems.  Only inert, spherical particles are considered. ticles due to particle-wall collision.  The flow field is isothermal. 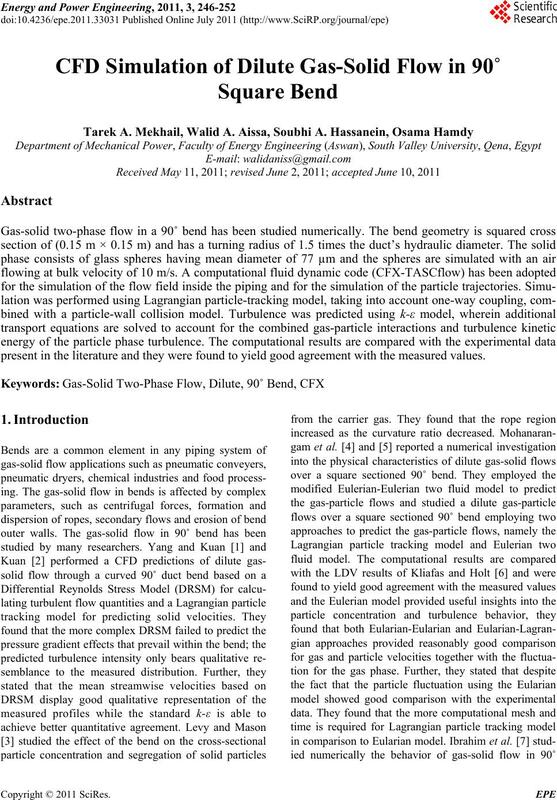 T. A. MEKHAIL ET AL. mass of the fluid in the volume occupied by the particle. affect the particle such as gravity or an electric field. experimental results on the viscous drag of a solid sphere. The coefficient of restitution is taken to equal unity. Figure 1. Elastic collision (coefficient of restitution = 1). cell density of (30 × 30 × 30) shown in Figure 2. Figure 2. Duct geometry and computational grid. Figure 3. Gas velocity vectors. the bend due to the adverse pressure gradient. the flow with and without particles is shown in Figure 7.
movement of the particles they setup slip velocities. These slip velocities in turn give rise to particle drag. lose some of its velocity trying to overcome this drag. behind the clean gas which has no particles. on all duct surfaces and plotted as shown in Figure 8.
therefore cause substantial increases in erosion. of gas phase with particles. Figure 7. 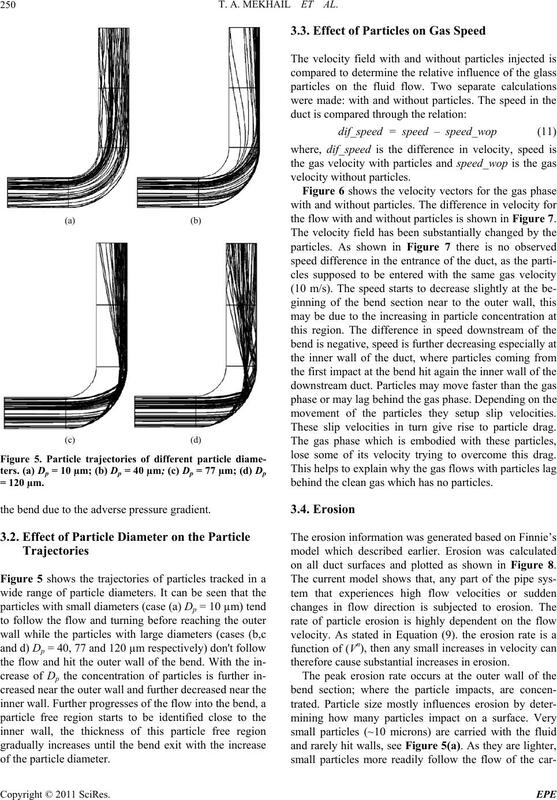 Change in velocity field due to particle flow. Figure 8. Erosion pattern on the duct wall. more the erosion will be. Vol. 98, No. 2, 1998, pp. 95-103. 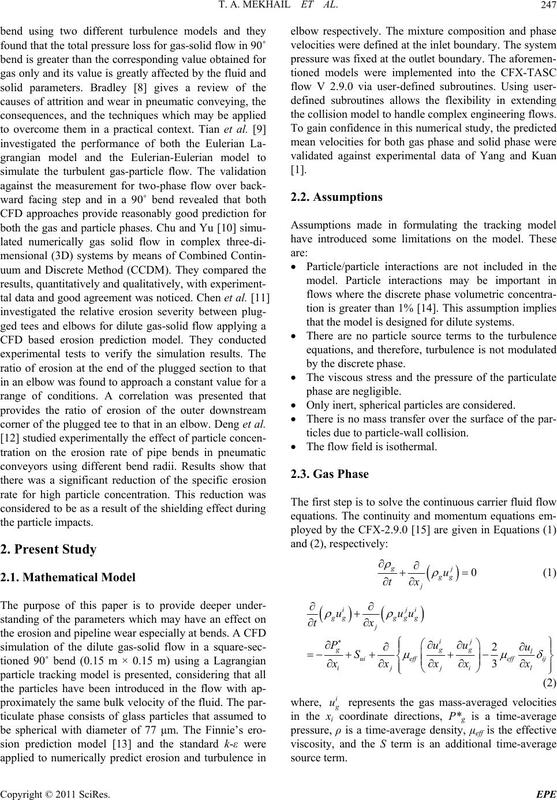 Chemical Engineering, Vol. 32, No. 3, 2008, pp. 561-571.
and Applied Mathematics, Vol. 48, 2007, pp. C741-C758. 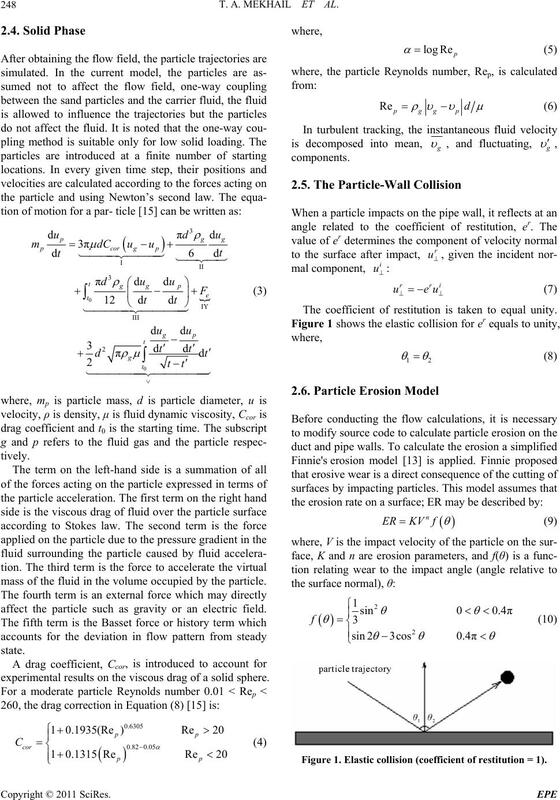 periments in Fluids, Vol. 5, No. 2, 1987, pp. 73-85. 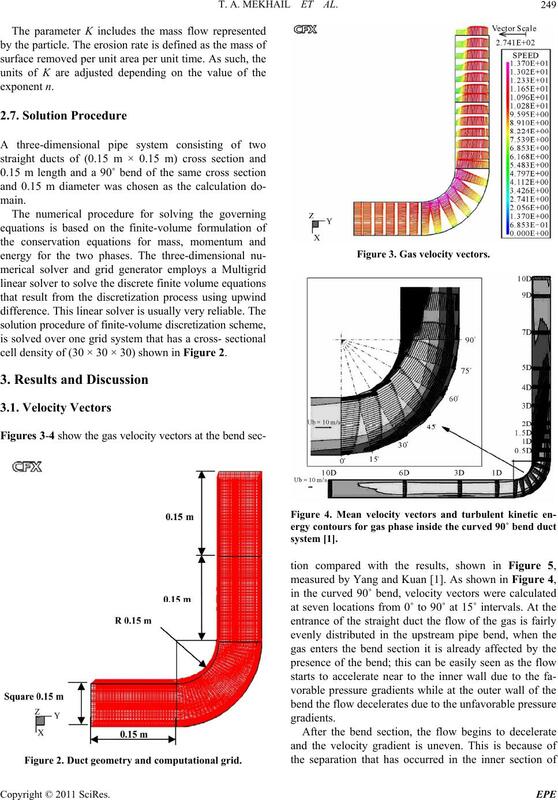 K. A. Ibrahim, M. A. El-Kadi, M. H. Hamed and S. M.
Alexandria Engineering Journal, Vol. 45, No. 4, 2006, pp. nical Paper No. 5, April 2002.
space, RMIT University, Melbourne, 2006. 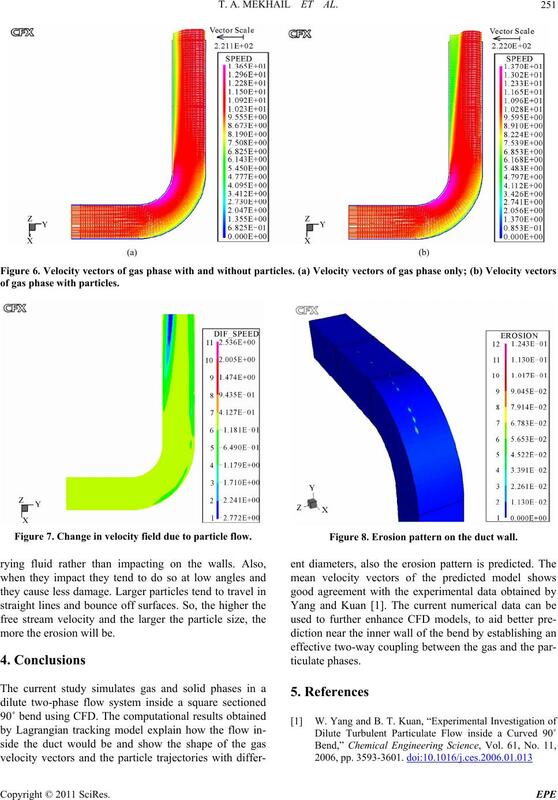 Complex Particle-Fluid Flows,” Powder Technology, Vol. 179, No. 3, 2008, pp. 104-114. 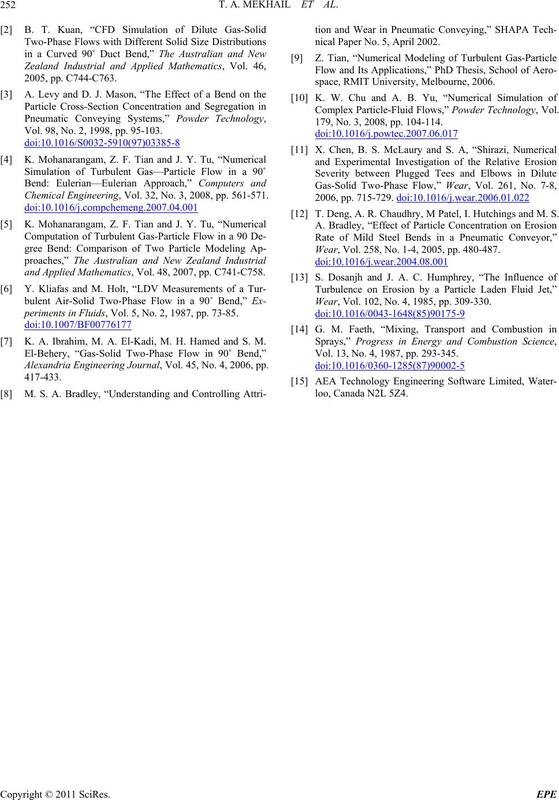 T. Deng, A. R. Chaudhry, M Patel, I. Hutchings and M. S.
Wear, Vol. 258, No. 1-4, 2005, pp. 480-487. Wear, Vol. 102, No. 4, 1985, pp. 309-330. Vol. 13, No. 4, 1987, pp. 293-345.